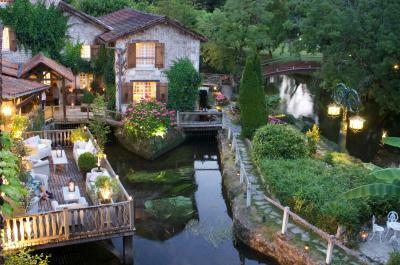 Lock in a great price for Le Moulin du Roc - Les Collectionneurs – rated 9.4 by recent guests! Very comfortable bed & pillows, right on the water with the sound of it very pleasant at night. Two sinks in a large bathroom with separate tub & shower. Staff were incredible as was the food. Would definitely come again to enjoy the pool and patio which we were not able to due to the weather. Very nice place, clean, good attention execellent food. Location, setting, appearance, style, facilities and staff. The hotel buildings and location are wonderful. Room was excellent. Food is of highest french standard, served by friendly and interested staff. Amazing location and setting. Food and service were exceptional. Fabulous location, beautiful decor. Pristine. Grounds and pool lovely. Very quiet and relaxing. Thierry and Annemarie are charming. Our car would not start on our last day and they were incredibly helpful!!! Dinner (Menu Degustation €125 per person) was one of the best meals we've had - seriously! The staff were very friendly - not pompous or formal. The setting by the river was absolutely stunning and the wine list was superb with choices to suit every taste. We stayed here for one night, and had the tasting menu which was just excellent. Staff were all so friendly and the hotel is simply stunning, immaculate gardens and beautiful. Rooms were a little dated but I guess this is the style and character of the property. Cannot wait to return! 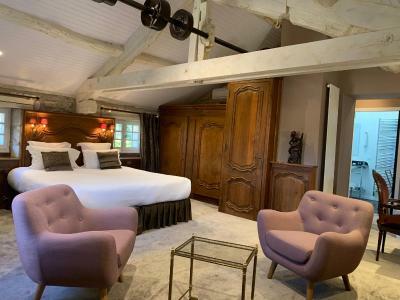 Nestled in Champagnac-de-Belair, in the heart of the Périgord region, Le Moulin du Roc was built in 1670 on the Dronne, a river which runs through its grounds. The property is 3.1 mi from Brantôme. The 15 rooms of the Moulin Du Roc are divided between the 3 buildings of the Moulin, interconnected by a maze of footbridges, terraces and intimate staircases. Each offers a happy mix of vintage furniture and the comforts of modern life. All overlook the river whose waters lull the visitor to rest. The restaurant is indisputably one of the best tables in the Périgord. The chef exploits all the richness of local produce with precise, yet seemingly simple cooking. The exceptional wine cellar offers more than 900 different varieties. Everything is there for you to spend a pleasant moment in one of the Moulin's 2 dining rooms or in the terraces outside, by the river. When would you like to stay at Le Moulin du Roc - Les Collectionneurs? Rooms are 35 square yards and located on the 1st floor. Rooms are 24 square yards and located on the 1st or 2nd floor. Rooms are 45 square yards and located on the 1st floor. Rooms are 60 square yards and located on the 1st floor. Rooms are between 25 and 35 square yards. They are located on the ground or 1st floor. Rooms are 39 square yards and located on the 1st or 2nd floor. House Rules Le Moulin du Roc - Les Collectionneurs takes special requests – add in the next step! Le Moulin du Roc - Les Collectionneurs accepts these cards and reserves the right to temporarily hold an amount prior to arrival. Please note that the gastronomic restaurant is closed on Tuesdays. Please inform Le Moulin du Roc - Les Collectionneurs of your expected arrival time in advance. You can use the Special Requests box when booking, or contact the property directly using the contact details in your confirmation. Breakfast arrangements were unusual in that cereals, bread, fruit, yoghurts etc were all placed on and overcrowded the table whether ordered or not and one day a week the regular kitchen staff had a day off and the process took over 1 1/2 hours, was badly managed and simply not up to the standard expected of this grade of hotel.. If our stay had been longer. Better rates (half board options) for booking direct. Felt like second rate guests initially for not booking direct and it was very awkward when I asked if we could upgrade to half board like all of the other guests.